Introducing the newest product from Laser Chemicals, designed specifically for the Hospitality, Restaurant & Coffee Shop Industries. What if every cup of coffee that you serve your customers is met with the unmistakable sounds of “mmmmmh”, “aaah” and “that’s a cup of really fresh coffee”. 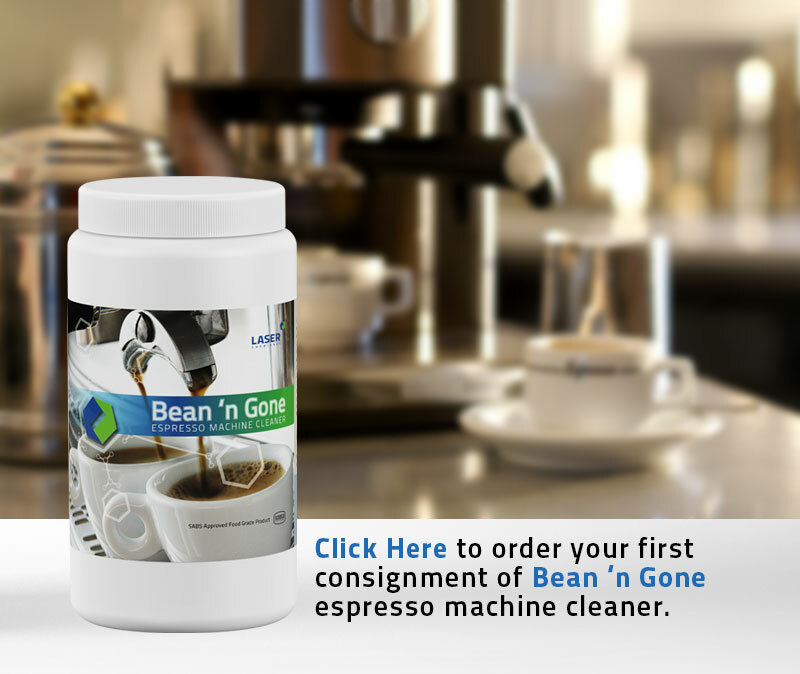 With our Bean ‘n Gone Espresso Coffee Machine Cleaner Detergent, your coffee machines will keep working perfectly, making coffee that is good to the last drop, ensuring the best results and compliments every time. Our premium quality, fast-acting, espresso machine cleaning detergent removes residual coffee oils, odours and bitter tannin from your group heads, lines and valves. The built-in water softener also prevents scale buildup. As part of our commitment to develop a wide range of eco-aware, planet friendly and versatile chemical and cleaning solutions, Bean ‘n Gone is made with BIODEGRADABLE & ORGANIC raw materials, whilst the container itself is fully recyclable. We adhere to strict International Quality Standards, with Laser Chemicals being ISO 9001 registered. Bean ‘n Gone is also certified as a SABS Approved Food Grade Product, thus meeting and exceeding your most stringent compliance needs. Available in 900g packs (25 units per box). Concentrated Quality – dilutions and proportions for use are on-pack. Manufactured with BIODEGRADABLE & ORGANIC raw materials. Storage instructions are clearly marked on-pack. For best results, use daily and follow the easy on-pack directions.